← Picture Perfect Shaker Kit by Queen & Co.
Hi everyone. 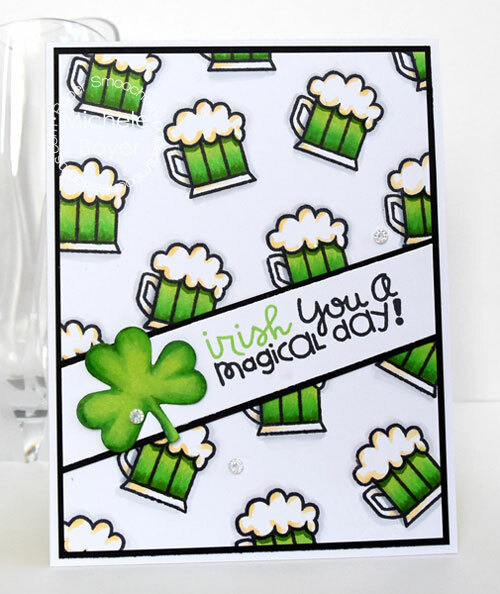 Today I have a card to share using Paper Smooches‘ Magical Spring stamp set. 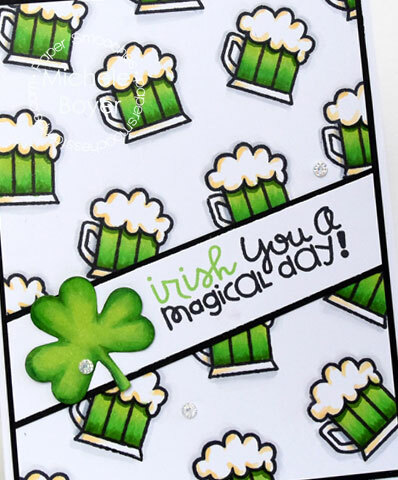 While I am not a fan of beer, I’ve always been fascinated by GREEN beer. Haha. It just seems fun (although I’ve never had it). I randomly stamped the glass then colored with Copic markers. I used the clover from Spring dies, cutting from X-Press It Blending Card and also coloring with markers. As a final embellishment I added a few white rhinestones from Queen & Company. Oh how simple, yet cute. Thanks for posting the copic color numbers. Have a great day.